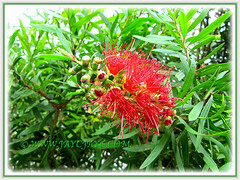 Callistemon citrinus, the fiery Red Bottlebrush! Definitely easier to remember this plant’s common name ‘Bottlebrush’ rather than its botanical name, as its flower spikes perfectly resemble bottle brushes! Right? The red-hot Callistemon citrinus will surely dazzle you as it did us. It is a showy shrub or small tree that’ll look magnificent, especially when it’s laden with deep and vibrant red flower spikes. Simply fabulous and truly irresistible if you love red and green, the colours of Christmas. Indeed, this fiery Red Bottlebrush became the perfect replacement for our Calliandra emarginata, a similarly coloured tree that was heavily infested with whiteflies and given the boot! In our eagerness to get this beautiful plant for our garden, we asked our younger son to buy one when we heard of a knockdown sale last June. It was held at a garden centre nearby his neighbourhood which was about 35 km away. Unfortunately, the small tree that we received was an aged and overstressed one, badly neglected with roots that were matted and had protruded from the drainage holes of an undersized black poly bag. Aaargh… no wonder, the price was a steal… just RM20, instead of RM50-70! Nine months down the road, and the straggly bush remains almost the same in spite of our tender loving care. 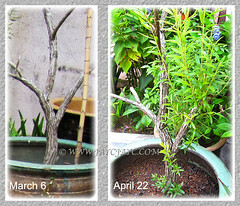 Well, I’ve given it a hard prune on two of its side branches last March to rejuvenate its growth and was pleasantly surprised to see that several new shoots have sprouted, even from the lower end of trunk. 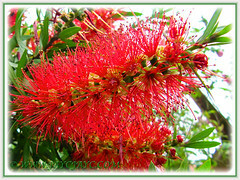 Frankly, this post was done, mainly to research into the right growing conditions for the Red Bottlebrush bush. Hopefully, with fresh insights, we’ll be able to get our container-grown bush healthy and luxuriant once again as it should be. Really looking forward to see its captivating flowers… even one spike will put a wide grin on our faces and make us so happy. 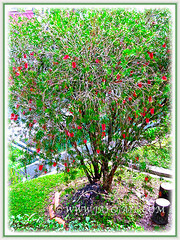 Common Name: Red Bottlebrush, Crimson Bottlebrush, Lemon Bottlebrush. Etymology: The genus name, Callistemon, is derived from 2 Greek words, kalos and stemon meaning beautiful stamens. The species epithet citrinus means lemon-scented, referring to the leaves that emit a distinctive citrus aroma when bruised. Origin: Endemic to states of Queensland, New South Wales and Victoria in Australia, where they are found in the region of rocky streams and near coastal swamps. Plant type: An ornamental perennial large shrub or small tree. 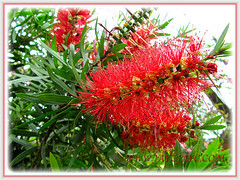 Features: Callistemon citrinus is one of the favoured species of the genus, Callistemon that consists of about 40 species of flowering shrubs. This species is hardier than most other species of bottlebrushes. 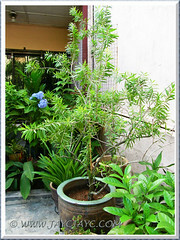 In cultivation, the evergreen large shrub or small tree that can trained to be single- or multi-trunked, reaches up to 4.5 m in height and spread as wide, growing at a medium pace. The bark is rough and rugged, somewhat stringy and coloured light brown to grey. As the plant ages, the branches tend to droop. It produces green foliage that is evergreen and dense, with flat, stiff, narrow and lanceolate leaves that are simple and alternately arranged. The foliage colour starts off in lemon-green with a tinge of pink and deepens to bright medium-green with age. 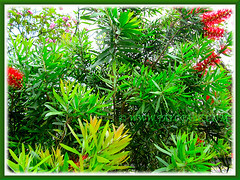 Their leaves have a refreshing lemon scent when crushed, hence one of its common names ‘Lemon Bottlebrush’. A floriferous shrub that blooms intermittently throughout the hot seasons. 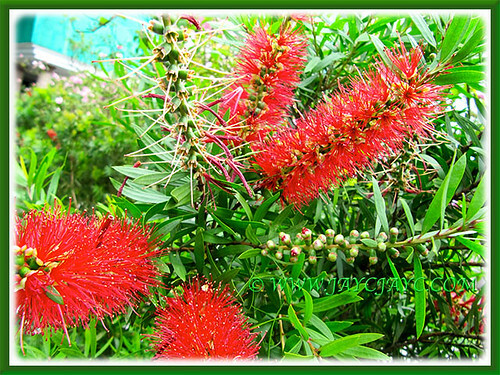 It produces showy, bottlebrush-shaped flower spikes in brilliant red at terminal branches. The cylindrical flower spikes are 6-10 cm long and 4-7 cm in diameter. Each spike is made up of several individual flowers, packed with numerous red filaments and tipped with dark golden anthers. The bottom flower buds open first and blooming progresses up the stem. The bright red flowers are hermaphrodite, that is, having both male and female organs, and are magnets for the nectar-feeding bees, butterflies and birds. Flowers will be followed by small, dark-coloured and woody fruits or capsules (each containing hundreds of tiny seeds), all clustered along the stem, somewhat unusual-looking and usually remain on the tree for long periods, unless removed for propagation or trimmed off. Many hybrids and cultivars have surfaced over the decades, and brought about other floral colour variations, such as white, pink, mauve, crimson, etc. Do check this link at Australian National Botanic Gardens where you can find photos of Callistemon citrinus cultivars, namely ‘White Anzac’, ‘Candy Pink’, ‘Firebrand’, ‘Mauve Mist’, ‘Splendens’ and others. Culture (Care): Callistemon citrinus grows easily with least care and rewards handsomely with eye-catching blooms. Moisture: Light to medium water requirements. Prefers regular waterings, though drought-tolerant once established. Soil: Prefers well drained and nutrient-rich soils that can be sandy, loamy or clayey. Adaptable to a variety of soils including acidic ones except very poor, alkaline or poorly drained soils. Others: Feed regularly, preferably once fortnightly, with a balanced fertiliser to promote lush growth and blooming. To keep the bush tidy, shoots should be trimmed after the blooming period, and unhealthy or damaged branches/stems removed. Callistemon citrinus takes well to hard pruning and even old matured plants will regenerate if pruned back hard into the old wood. To maintain a tree-form, prune to develop a few solid trunks, then periodically remove new shoots from the base of trunk and prune the lower branches or drooping ones. Generally, it is resistant to pests and diseases. Occasionally, it can be infested with scale insects, red spider mites and mealybugs, especially on indoor plants in a glasshouse. For subtropical and temperate regions: Hardiness: USDA Zone 8B-11. It may receive frost damage at -7 to -10°C, thus would benefit with some winter protection. Best to grow the Lemon Bottlebrush on the ground but in non-hardy regions, it’s advisable to grow it in a large container and overwinter indoors in a bright sunny and cool room or greenhouse. Flowers bloom from early spring through summer or intermittently throughout the year in frost-free areas. Trim shoots after the blooming period and remove unhealthy or damaged plant parts in mid spring. To propagate new plants, sow seed in spring and root cuttings in late summer. Propagation: Best from semi-hardwood cuttings that root easily in sandy and moist soils. Can be propagated by seeds germination, but may yield variable results. Usage: A blooming Callistemon citrinus tree with its striking and vibrant red flower spikes will make a brilliant and dramatic display in any garden, park or landscape. Most ideal as a large ornamental shrub, single specimen, hedge or privacy screen. Plant a few of these beautiful landscape trees to line your driveway, fence or help mark your property’s boundary. Our local Town and Landscape Architects just love planting them along road median, byways and highways, or mass-plant them at roundabouts. Though the Red Bottlebrush grows best in the ground, it does great in large containers too, either located outdoors or indoors in a greenhouse. If you’re a nature lover, grow Red Bottlebrush bush as an attractive magnet for nectar-feeding insects, butterflies and birds to your garden. The leaves and flowers are known to have been used as a tea substitute, flowers are also used to produce dye and old wood used for tool handles and firewood. Well done on your efforts to look after this poor thing. It’s obviously had a very stressful previous life. I do so hope it rewards all your efforts with some lovely flowers soon. They are a spectacular looking thing when covered in blooms. We appreciate your visit here… thanks and have a lovely day. I like these a lot. One of those that will grow with utter neglect and not fussy about soil type, acidity, watering wind, tropics just nothing seems to bother it much even a fair ammount of cold. Here where we have a mainly Chinese popultion and they love growing them as a standard with long weeping branches, like a flowering willow. It’s a very common and quite attractive site in the early wet season when they are all in flower. We only seem to have one species. Out of flower they dissapear completely though as the leaves are not very special of this one they grow. However looking at the list on the link here to the Australian botanicle gardens its incredible how many varieties there are. 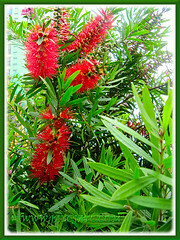 When I was visiting my brother in WAustralia I was completely charmed by the hybrid Callistemon “Little John”. It has the deepest ruby most glowing red upright bottle brushes I’ve ever seen. The leaves too are a very attractive blue grey. The whole plant is small, slightly spreading and strongly woody. All forming an attractive knarled little prostrate tree. With those densely packed little narrow stiffish looking blue grey leaves and incredible red upright brushes its quite a sight in full flower. Needless to say I snapped one up when that same year (this year in fact) I saw them at a nursery in Australia. Mine is a tiny little specimen just ten cm tall now and about thirty cm wide but already every branch has a brilliant brush on it this its first “spring”. Over the moon with this one and I think it could do very well in a large pot too, looking very mediteranian, very much, yet thriving in the tropics. I dont say this often but its a win win number (: if anything was ever. Only draw back if it is one is it’s slower growing, but thats ok in a pot or raised bed. Hope yours thrived. I think it can be renevated easily like that. Now the question is what to do with the somewhat less attractive knobbly woody seed capsules after the flowers are gone? Is that the time to prune or do we leave them and the branches carry on growing other side of them? Im not sure with mone because it’s so tiny already…..
Our potted bush is about 1.5m tall, flush with lustrous green foliage but just refuses to flower in spite of feeding it fortnightly with flower fertiliser with a higher phosphorus and potassium content. Any suggestion to promote buds and blooms will be much appreciated, Anton.